Dot Net developers build strong software using languages and technologies of.Net framework. 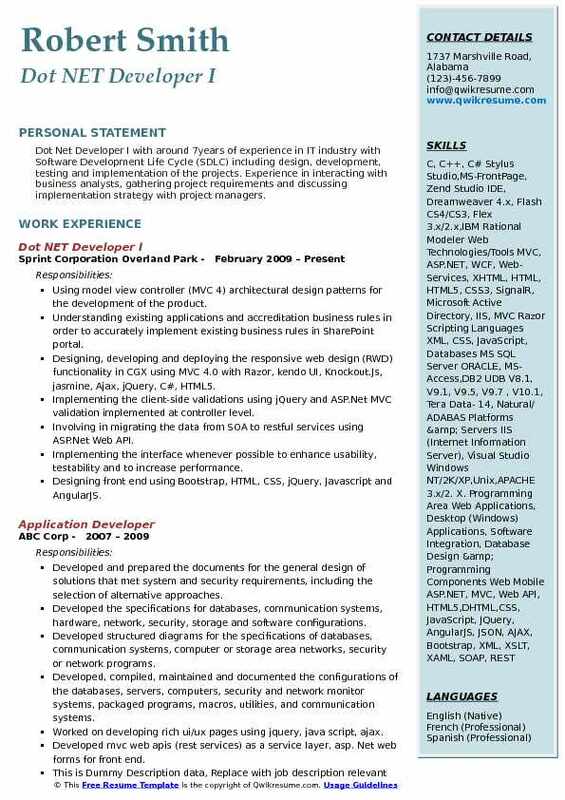 Some of the responsibilities that are taken up and commonly listed in the .Net Developer Resume are participating in requirement study, collaborating with inside teams to produce software architecture and design, writing clean and scalable codes using .net languages, testing and deploying applications and systems, revising, updating and refactoring codes, improving existing software, developing documentation via SDLC, providing technical support and working with business analyst. 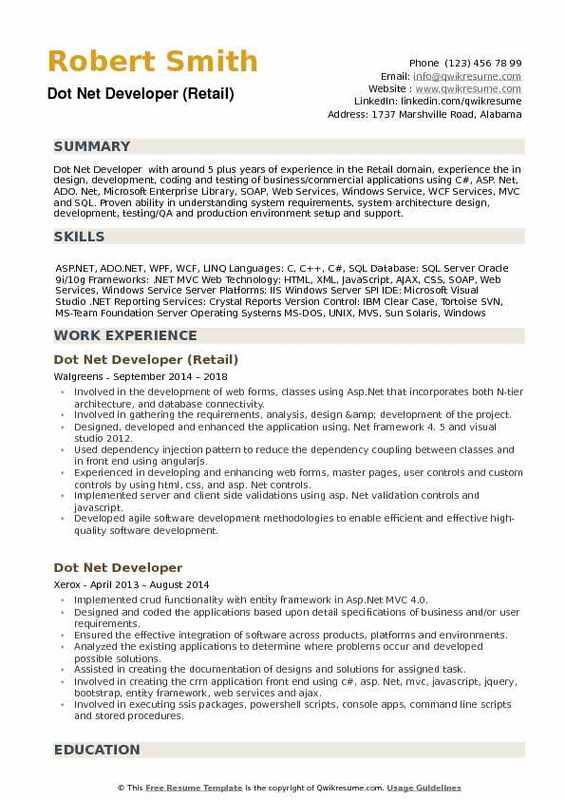 Some of the best Dot Net Developer resumes depict dot net expertise, coding capabilities, familiarity with ASP.NET framework, SQL server, knowledge of .net languages, familiarity with architectural styles and fluency in agile methodologies. Eligible dot net developers embrace a Degree in Engineering or Computer science with a valid Microsoft certification. 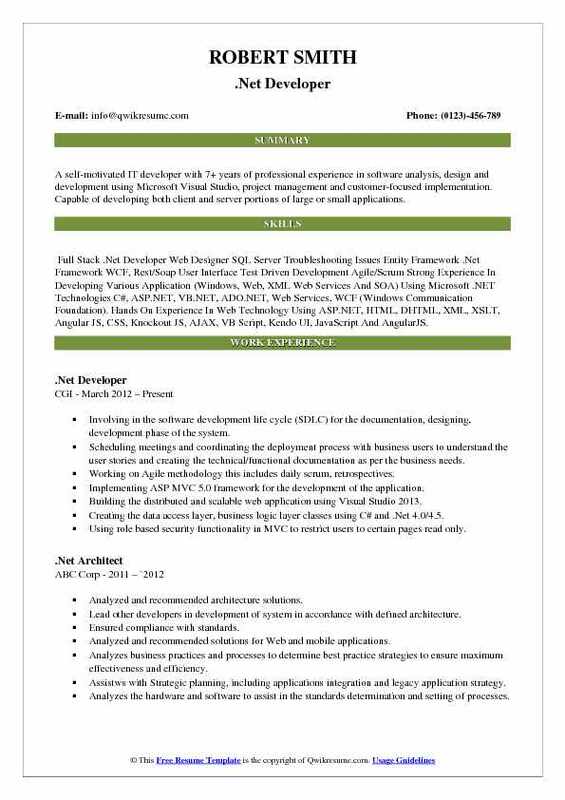 Headline : Dot Net Developer with Seven years of experience in design and development of web-based and windows based applications using .net technologies. Hands on experience in all phases of software development life cycle (SDLC) like Requirement Gathering, analysis, architectural and detail design, documentation, development, testing and implementation using AGILE methodologies like Scrum, XP and test driven environment. Assisting in developing architectural design and functional specifications. Involving in analysis, designing, coding and implementation of the application. Developing dynamic web page and implemented and creatively implemented design requirements using client side scripting language and technologies. Assisting in agile software development management activities to respond to the unpredictability through iterative sprints. Designing and developing web application while migrating the project into MVC architecture using MVC 3 so as to separate the internal representations of information. Involved in developing telerik kendo UI controls for building the application enabling to focus on value generating development tasks. Involving in the development of presentation logic for GUI of ASP.Net pages. Using Angular JS to split the app into MVC components which manages and serves as the pipeline that connects the components. Enhancing the website for improvised usability for the customer and optimized page layout using HTML, CSS, Bootstrap and Angular JS. 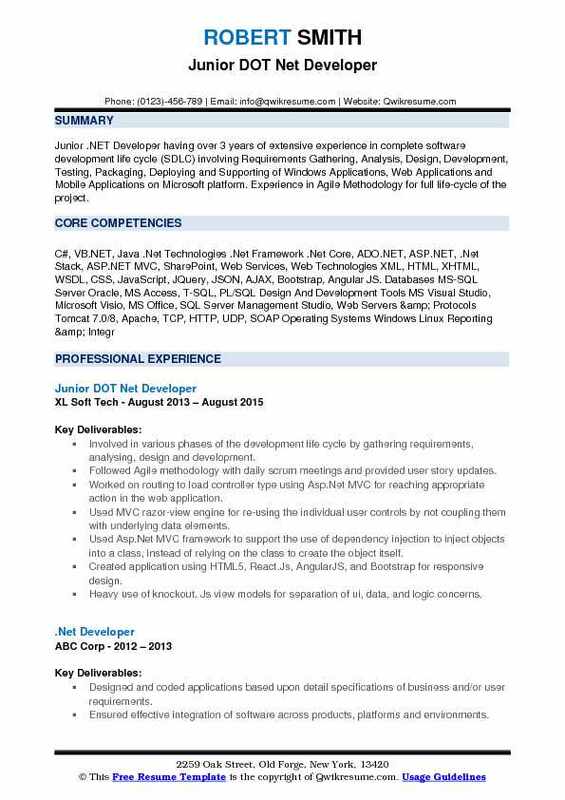 Objective : Junior .NET Developer having over 3 years of extensive experience in complete software development life cycle (SDLC) involving Requirements Gathering, Analysis, Design, Development, Testing, Packaging, Deploying and Supporting of Windows Applications, Web Applications and Mobile Applications on Microsoft platform. Experience in Agile Methodology for full life-cycle of the project. Involved in various phases of the development life cycle by gathering requirements, analysing, design and development. Followed Agile methodology with daily scrum meetings and provided user story updates. Worked on routing to load controller type using Asp.Net MVC for reaching appropriate action in the web application. Used MVC razor-view engine for re-using the individual user controls by not coupling them with underlying data elements. Created application using HTML5, React.Js, AngularJS, and Bootstrap for responsive design. Heavy use of knockout. Js view models for separation of ui, data, and logic concerns. Created new HTML helper classes for rendering of HTML controls in a view. Performed client side and server-side validations in MVC razor using jquery and ajax. Headline : A self-motivated IT developer with 7+ years of professional experience in software analysis, design and development using Microsoft Visual Studio, project management and customer-focused implementation. Capable of developing both client and server portions of large or small applications. Involving in the software development life cycle (SDLC) for the documentation, designing, development phase of the system. Scheduling meetings and coordinating the deployment process with business users to understand the user stories and creating the technical/functional documentation as per the business needs. Working on Agile methodology this includes daily scrum, retrospectives. Implementing ASP MVC 5.0 framework for the development of the application. Building the distributed and scalable web application using Visual Studio 2013. Creating the data access layer, business logic layer classes using C# and .Net 4.0/4.5. Using role based security functionality in MVC to restrict users to certain pages read only. Extensively using jQuery to make client side validations and used AJAX calls where ever necessary for auto filing fields and performing asynchronous calls. Utilizing Kendo controls like (grid, listview, datetimepicker, map API) to develop rich UI forms. Involving in interface design of web application from design to implementation. Creating CSS files to be applied to various web forms on the web pages. Creating business entities and configuring xml files for database mapping in the business layer using C#.Net language. Developing custom controls and user controls for reusable part of the web pages using C#.Net with Asp.Net. Used C#.Net Asp.Net web application in Linq to SQL for database connectively. Creating Model View Controller (MVC) design pattern to create reusable code. Implementing master page allow centralize the common functionality of the pages so that can make updates in just one place. Implementing error handler web control as a delegated event handler for all page errors and writing code in C# for exception handling. Implementing generics for creating object collections and extensively implemented for maintaining type safety so that run time errors are reduced. 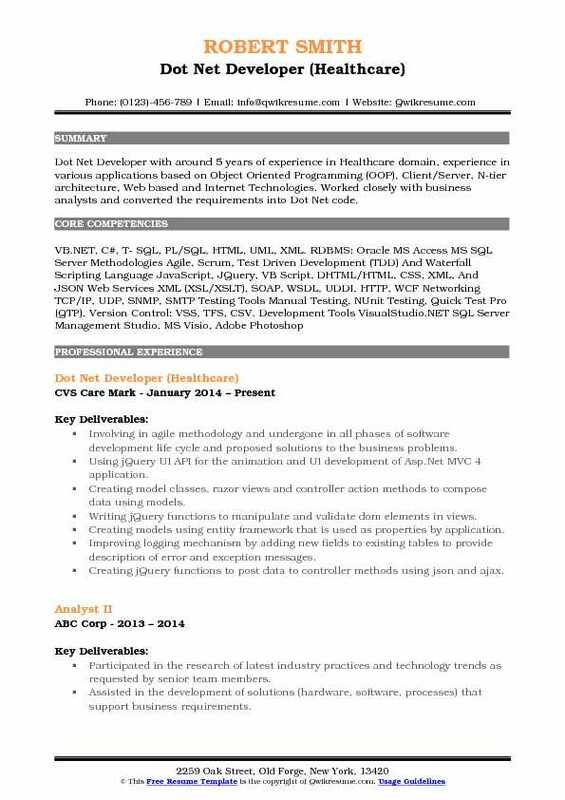 Summary : Dot Net Developer I with around 7years of experience in IT industry with Software Development Life Cycle (SDLC) including design, development, testing and implementation of the projects. Experience in interacting with business analysts, gathering project requirements and discussing implementation strategy with project managers. Using model view controller (MVC 4) architectural design patterns for the development of the product. Understanding existing applications and accreditation business rules in order to accurately implement existing business rules in SharePoint portal. Designing, developing and deploying the responsive web design (RWD) functionality in CGX using MVC 4.0 with Razor, kendo UI, Knockout.Js, jasmine, Ajax, jQuery, C#, HTML5. Implementing the client-side validations using jQuery and ASP.Net MVC validation implemented at controller level. Involving in migrating the data from SOA to restful services using ASP.Net Web API. Implementing the interface whenever possible to enhance usability, testability and to increase performance. 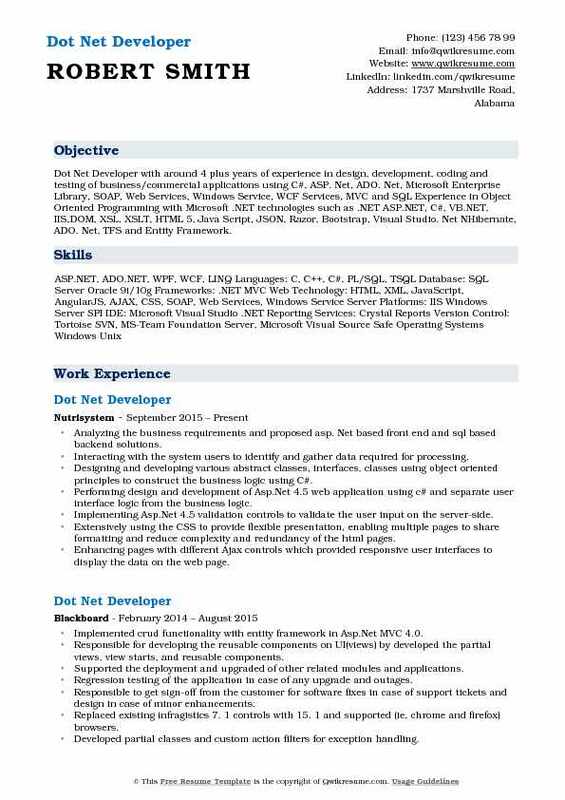 Objective : Dot Net Developer with around 4 plus years of experience in design, development, coding and testing of business/commercial applications using C#, ASP. Net, ADO. Net, Microsoft Enterprise Library, SOAP, Web Services, Windows Service, WCF Services, MVC and SQL Experience in Object Oriented Programming with Microsoft .NET technologies such as .NET ASP.NET, C#, VB.NET, IIS,DOM, XSL, XSLT, HTML 5, Java Script, JSON, Razor, Bootstrap, Visual Studio. Net NHibernate, ADO. Net, TFS and Entity Framework. Analyzing the business requirements and proposed asp. Net based front end and sql based backend solutions. Interacting with the system users to identify and gather data required for processing. Designing and developing various abstract classes, interfaces, classes using object oriented principles to construct the business logic using C#. Performing design and development of Asp.Net 4.5 web application using c# and separate user interface logic from the business logic. Implementing Asp.Net 4.5 validation controls to validate the user input on the server-side. Extensively using the CSS to provide flexible presentation, enabling multiple pages to share formatting and reduce complexity and redundancy of the html pages. Enhancing pages with different Ajax controls which provided responsive user interfaces to display the data on the web page. Using AngularJS for the implementation of the selection module of coverage plan. Extensively using Ajax applications for reduction of round tripping of data using the update panel controls. Using Windows Communications Foundation (WCF) for employee data display and validation. Implementing the SQL runner application to run the custom and core scripts for key stone edge. 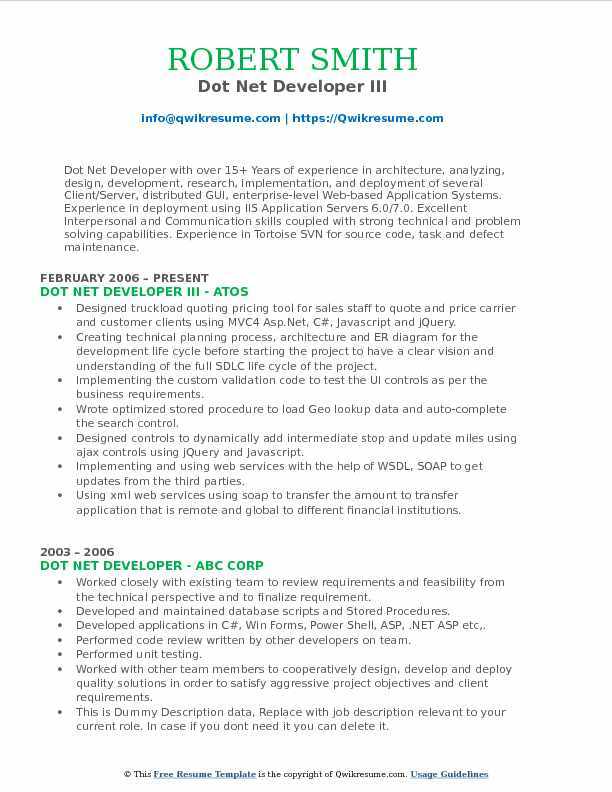 Summary : Dot Net Developer with over 15+ Years of experience in architecture, analyzing, design, development, research, implementation, and deployment of several Client/Server, distributed GUI, enterprise-level Web-based Application Systems. Experience in deployment using IIS Application Servers 6.0/7.0. Excellent Interpersonal and Communication skills coupled with strong technical and problem solving capabilities. Experience in Tortoise SVN for source code, task and defect maintenance. Creating technical planning process, architecture and ER diagram for the development life cycle before starting the project to have a clear vision and understanding of the full SDLC life cycle of the project. Implementing the custom validation code to test the UI controls as per the business requirements. Wrote optimized stored procedure to load Geo lookup data and auto-complete the search control. Implementing and using web services with the help of WSDL, SOAP to get updates from the third parties. Using xml web services using soap to transfer the amount to transfer application that is remote and global to different financial institutions. Developming the client side validation techniques using jQuery and Angular JS directives. Developing and consuming the WCF services/web services with Service Oriented Architecture (SOA). 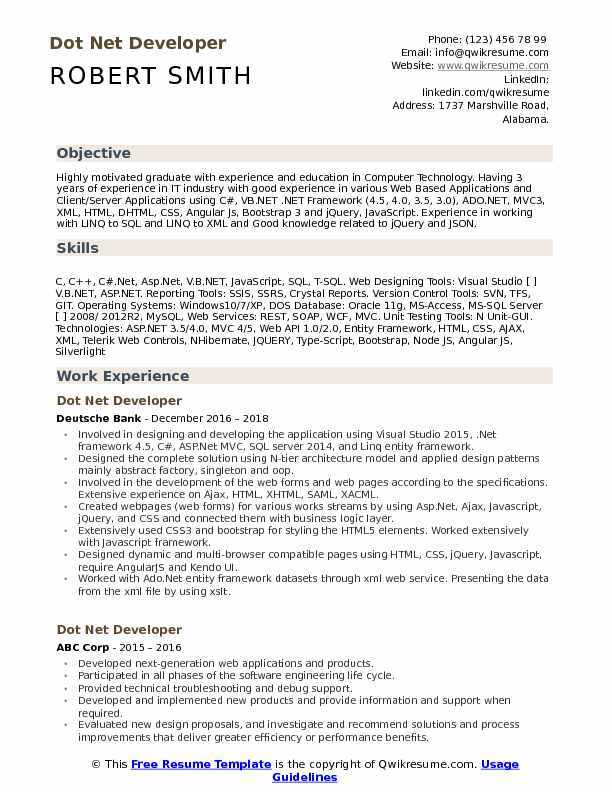 Headline : Dot Net Developer with around 5 years of experience in Healthcare domain, experience in various applications based on Object Oriented Programming (OOP), Client/Server, N-tier architecture, Web based and Internet Technologies. 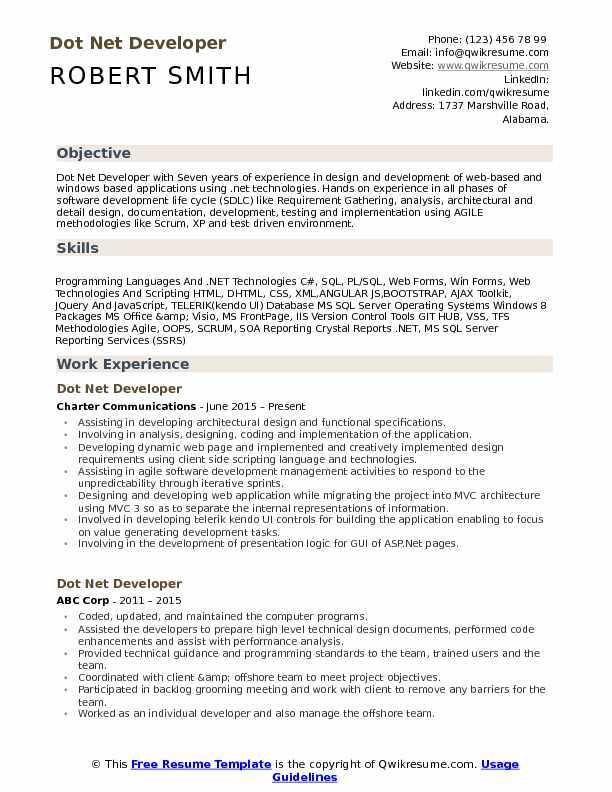 Worked closely with business analysts and converted the requirements into Dot Net code. Involving in agile methodology and undergone in all phases of software development life cycle and proposed solutions to the business problems. Using jQuery UI API for the animation and UI development of Asp.Net MVC 4 application. Creating model classes, razor views and controller action methods to compose data using models. Writing jQuery functions to manipulate and validate dom elements in views. Creating models using entity framework that is used as properties by application. Improving logging mechanism by adding new fields to existing tables to provide description of error and exception messages. Creating jQuery functions to post data to controller methods using json and ajax. Wrote stored procedures, triggers and sql queries in sql server 2008. Interacting with the client-support team, and clarified their queries about the product. Creating look up tables that are used to populate data in drop down controls. 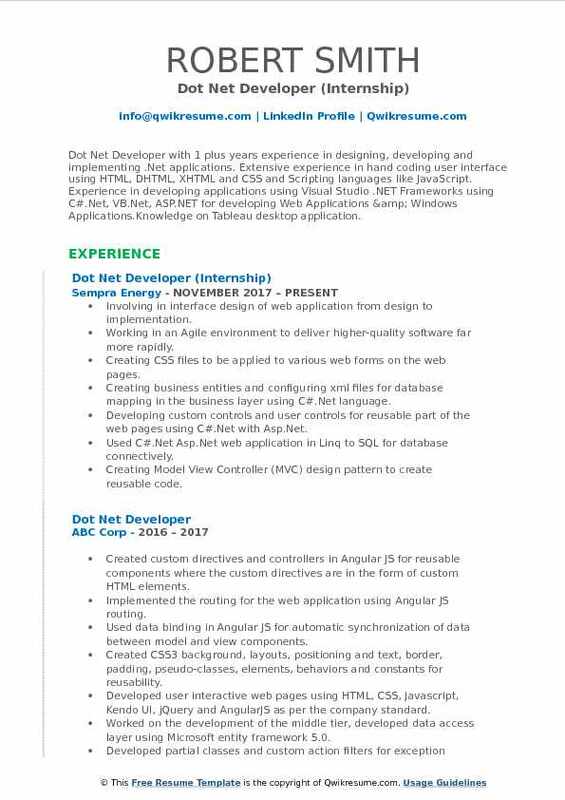 Headline : Dot Net Developer with around 5 plus years of experience in the Retail domain, experience the in design, development, coding and testing of business/commercial applications using C#, ASP. Net, ADO. Net, Microsoft Enterprise Library, SOAP, Web Services, Windows Service, WCF Services, MVC and SQL. Proven ability in understanding system requirements, system architecture design, development, testing/QA and production environment setup and support. Involved in the development of web forms, classes using Asp.Net that incorporates both N-tier architecture, and database connectivity. Designed, developed and enhanced the application using. Net framework 4. 5 and visual studio 2012. Used dependency injection pattern to reduce the dependency coupling between classes and in front end using angularjs. Experienced in developing and enhancing web forms, master pages, user controls and custom controls by using html, css, and asp. Net controls. Developed agile software development methodologies to enable efficient and effective high-quality software development. Worked on different aspects of. Net framework like Asp.Net 4.5 and on middleware ado. Net. Created and deployed web services using asp. Net, soap and xml for pulling customer service records. Involved in designing and developing the application using Visual Studio 2015, .Net framework 4.5, C#, ASP.Net MVC, SQL server 2014, and Linq entity framework. Designed the complete solution using N-tier architecture model and applied design patterns mainly abstract factory, singleton and oop. Involved in the development of the web forms and web pages according to the specifications. Extensive experience on Ajax, HTML, XHTML, SAML, XACML. Worked with Ado.Net entity framework datasets through xml web service. Presenting the data from the xml file by using xslt.